Do you remember how this time last year we were told that the Tories were going to win a massive landslide victory in the snap election (which we were promised was not going to happen)? The Daily Mail told us May was going to ‘Crush the Saboteurs’ – by which I think they meant people like you and me. And all those pesky judges and civil servants. And we were told May would be strong and stable. Well, she didn’t win her landslide, she isn’t strong and she isn’t stable. But more importantly, the saboteurs have not been crushed and we won’t be crushed. A few months can be a long time in politics. 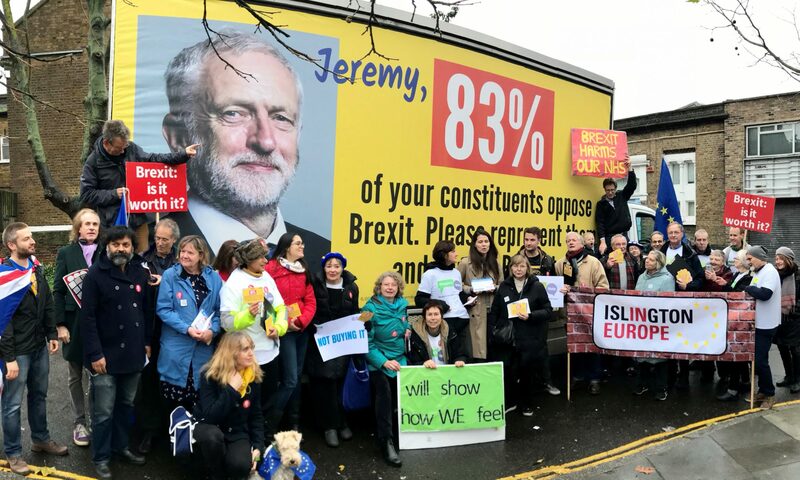 If we persist, we have a chance at securing a People’s Vote on the final deal, and with that, a chance to put an end to this madness. Let’s remember that leaving the EU means abandoning the many rights and protections that are afforded to each and every person living in this country. And given recent events, I think we can all agree that having another layer of protection is a vital necessity, not just a nice add-on. The Windrush scandal is a stain on our nation and our conscience. I believe it is the direct result of a racist ‘hostile environment’ policy, enacted by a Home Secretary and now PM who is obsessed with immigration at the expense of reason and humanity. It seems the British government is responsible for wrongfully splitting up families and ruining lives, and so far, no one has been truly held to account. Meanwhile, Labour is engulfed in an anti-Semitism scandal. Ever more details are emerging of how the Leave campaign and its friends at Cambridge Analytica and related companies reportedly broke our electoral laws and manipulated voters. HMRC is under fire for failing to investigate a company for money laundering, citing its donations to the Tory party. The Brexiters Johnson, Fox and Davis are so far out of their depth the EU has said it is genuinely worried, because we are completely and utterly unprepared for what is to come. In normal times, any one of these things would have the potential to derail a government, but we are so consumed by Brexit, so confused by what is going on, we are like rabbits caught in the headlights. The trouble is, if we do nothing, then this slide towards misinformation, populism, xenophobia, hostility and division will only continue. History has taught us that if you do not speak out for others, then by the time they come for you, there is no one left to defend you. So I will continue to speak out — for my fellow Britons who are victims of this government. For my fellow Britons who are being lied to over Brexit and who will suffer the most if it goes ahead. For my fellow EU citizens and all their loved ones – many Brits included – who have done nothing wrong and who now face intolerable uncertainty and anxiety. And ultimately, it is important to stress that this is not just about Brexit, it’s about what kind of nation we want the UK to be. Is what we have become now good enough for us? I say, no. It is definitely not. I want my politicians to be honest and to take responsibility for their mistakes. I want them to lead and shape public opinion for the greater good, to make the case for immigration and diversity. To promote equality and tolerance. I want them to respect the pillars of our democracy and its institutions, to make well-informed decisions based on good information. I want people to cooperate, so politics is not a zero-sum game. I want us to work with our friends and allies in Europe. I want to be free. To travel, to work, to love, to raise a family in the midst of my European family. I know stopping Brexit is not a simple fix for all the problems we face as a nation, but it is a vital step in that direction. And it will give us the energy, time and focus to confront all the other issues and challenges. I know sometimes it is hard to stay engaged and to keep fighting. It seems futile in the face of such intransigence from the government, no matter how many facts they are confronted with. In the era of disinformation we now live in, the truth doesn’t seem to matter. But we can prevail. We have already come a long way – no one was even speaking of another vote a year ago, now it is a topic of conversation, even on the BBC. When Brexiters speak of having to fight back against us, it’s because they are worried and also do not see the argument as being won. Write to your MP, tweet, join a campaign group, block out 23 June in your diary for the march on Westminster, back the People’s Vote. Keep being a saboteur. We can do this.